With its next-gen GPU not even out the gates yet, AMD on Monday roughly sketched out its roadmap for the next few years. 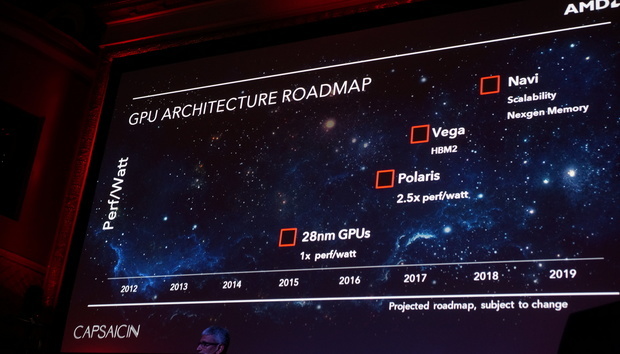 Following the launch of its Polaris GPU this year, the company release its Vega GPU family, using HBM2 memory, said Raja Koduri, head of AMD’s Radeon Technologies Group. Vega will be followed by Navi, a GPU family that will offer scalability and “next-gen memory," Korduri said. Both will build on the performance-per-watt mantra that AMD has been pushing with its Polaris chip. Polaris itself was demonstrated during the announcement, running the new game Hitman “smooth like butter” in a small form factor box. AMD demonstrated Polaris in December running Star Wars Battlefront using far less power than a comparable Nvidia GPU. The news came on the same day that the company formerly unveiled its Radeon Pro Duo card, which is expected to give the company the title of fastest single GPU in town. Competitor Nvidia has been quiet lately on hardware, but most expect the company to release its own next-gen GPU within the next month or two. Why this matters: Hard details of Vega and Navi are few and far between, but even a roughly sketched roadmap from the ailing chip maker is a promising sign given that AMD has been fighting a losing battle with both Intel and Nvidia the last few years.